Dr. Anthony Cummings sat down with leaders of an indigenous community in Guyana last summer to share an unconventional idea to help them conserve the land their people have lived on for thousands of years. 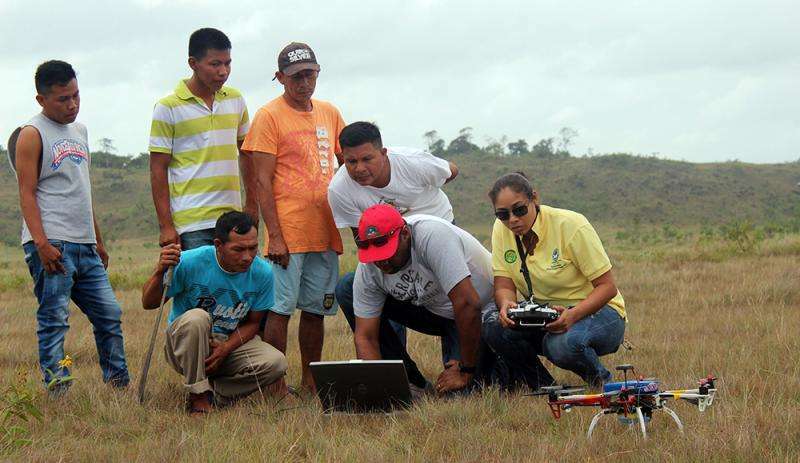 The assistant professor of geospatial information sciences in UT Dallas' School of Economic, Political and Policy Sciences wanted to use drones to capture images of the Makushi people's Amazon rainforest farmland. The goal was to track and study how changes on their farming plots affect the ecosystem and wildlife over time. Cummings was seeking more than permission. He needed the community's help building and flying the drones. Cummings, who is from Guyana, had already built friendships with Makushi farmers while conducting other research on the ecosystem there. 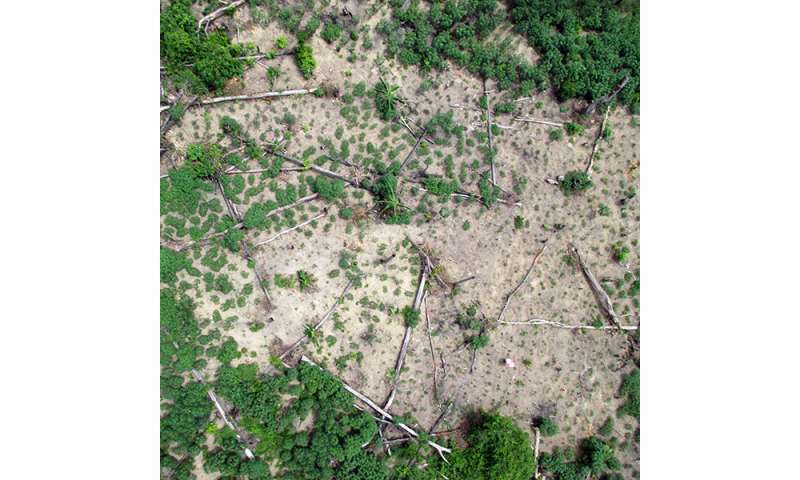 He reasoned that technology and scientific methods could help them better manage their resources and provide data needed to participate in programs that provide financial incentives for avoiding deforestation. The Makushis have internet access, cellphones and electricity generated through solar panels, but drones were something new. Cummings wanted to ensure that they work together to develop a method for collecting data that respects the Makushi way of life. "Inclusion in farming and cultural practices is inherent to the Makushi way," Cummings said. After discussions, community leaders agreed to fly the unmanned aerial vehicles (UAV) once a month and send the data to Cummings. Next came the training. Cummings wanted to make sure the residents knew how to maintain and reassemble the drones in case anything went wrong. "We showed them a video, put the parts on the table and said this is what you need to build a UAV," Cummings said. "Within eight hours we had two UAVs in our hands. They built the UAVs in the time it takes me to put one together." Soon, Cummings was gathering trainees in an open field to fly their first mission. "It was such an exciting moment," Cummings said. "Everyone came to see it and had their cameras out. They had a blast. I did too." A $5,000 grant from the School of Economic, Political and Policy Sciences Advisory Council made the project possible. The funds helped cover Cummings' travel, the drone equipment and support for the farmers. The images started coming last fall. Yogita Karale, a PhD student in the GIS program, sits at her computer, nearly 3,000 miles away, studying the images that look like the top of broccoli stalks to the untrained eye. The images show crops including watermelons, corn and the staple cassava, also called manioc and yucca. "We are looking for changes over time," Karale said. "In one of the farm data maps I'm working on, vine plants are replaced by manioc and tree logs are being moved. There are a lot of changes even within a time frame of a month in these areas." The project has worked so well, Cummings said he hopes to expand it. Guyana has more than 100 Amerindian communities and they represent the fastest-growing population in that nation. 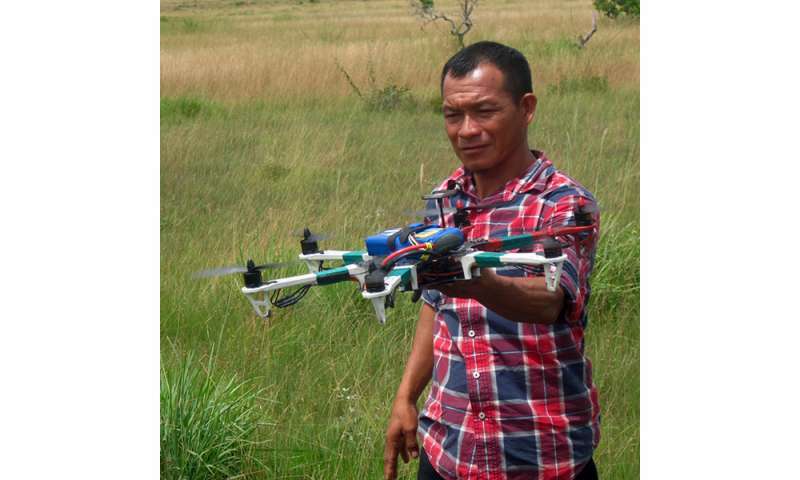 He hopes that his work will inspire other researchers to continue to explore how UAVs can be used to study indigenous lands to help residents sustain their livelihoods. Cummings is completing the work in collaboration with the Hydrometeorological Services, Ministry of Agriculture, Guyana and the Ministry of Indigenous Peoples Affairs.